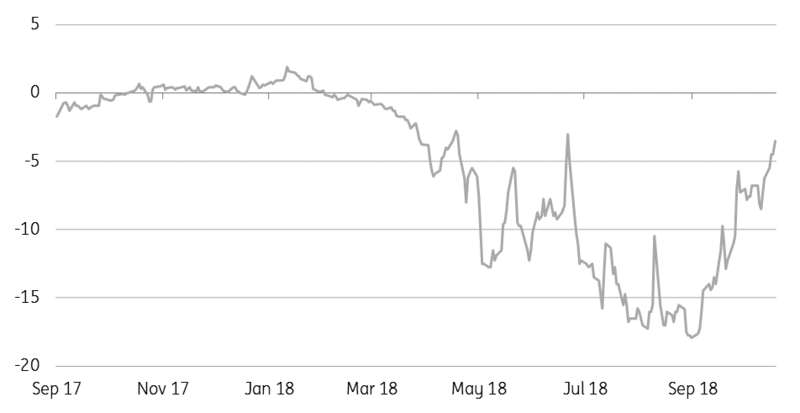 Midland/WTI Cushing differential: The discount between Midland crude oil and WTI Cushing continues to narrow, with the spread currently trading at $3.50/bbl, the narrowest since late June. The spread has strengthened considerably since early September, following news that Plains All American will begin operations on its expanded Sunrise pipeline by the end of October. Recent stock builds in Cushing would have also offered some support to this spread. However, with strong production growth in the Permian expected to continue, it is likely that as this additional pipeline capacity is utilised, the spread will come under pressure once again. Chinese refinery throughput: The latest data from the National Bureau of Statistics shows that refiners in the country processed 51.34mt of crude oil over the month of September. This is equivalent to 12.54MMbbls/d, and a 5.4% increase month-on-month, and 4% increase year-on-year. Meanwhile, cumulative refinery throughput so far this year has averaged 12.2MMbbls/d, up 8.1% YoY. Weaker than expected Chinese data: The latest data out of China this morning was on the weaker side, with the country’s GDP growth slowing to 6.5% in the third quarter compared to market expectations of 6.6% and down from 6.7% in the second quarter, while industrial production growth also dropped from 6.1% in August to 5.8% in September. Beijing has announced a number of stimulus measures to offset the impact of trade tensions with the US, however this could take some time to feed through. Chinese metal imports have been strong over 3Q18, but whether this reflects real consumption or stock building has yet to be seen. Sharp fall in zinc inventories: On-warrant LME zinc stocks fell 23% (31.9kt) yesterday to 105.4kt providing support to the near-term spreads, with the LME zinc cash/3M spread widening to a two-month high of $48/t. We continue to hold the view that there is further upside to zinc prices over 4Q, however growing mine supply over 2019 should cap the rally. CS Brazil sugar production: Industry body UNICA estimates that sugar production in the current CS Brazil season could fall to 26mt from 36mt last season. The reduction is largely a result of a strong allocation of sugarcane to ethanol production, given domestic ethanol prices are more attractive than sugar prices. Meanwhile, as a result of poorer yields, UNICA expects cane availability to fall to around 560mt, down from 596mt last season.